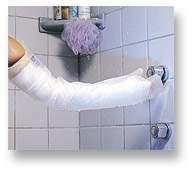 You have the satisfaction of knowing the AquaShield is the safest, most effective cast and bandage protector available. It has been used daily by hundreds of thousands of patients for bathing, showering and swimming (some as long as four years) without a tear or leak. The AquaShield is manufactured by Orthomed Products, Inc. in Grass Valley, California since 1988. Successful AquaShield distributors are generally calling on orthopedic and podiatry offices and related hospital departments. In addition hand surgery, lymphedema, burns, diabetic and ulcerated wounds, prosthesis, IV sites, PICC lines are also good opportunities for the AquaShield. Although our domestic distributors operate on a non-exclusive basis, we generally do not appoint distributors to overlapping territories. Distributors receive a substantial discount from the professional wholesale price. We support our distributors with excellent literature, unmatched quality, unconditional one-year warranty replacement, and a generous sample program. We believe the AquaShield is superior to the other cast protective devices and competitively priced, making it an attractive addition to your line.